When Rachel Bertsche first moves to Chicago, she's thrilled to finally share a zip code, let alone an apartment, with her boyfriend. But shortly after getting married, Bertsche realizes that her new life is missing one thing: friends. Sure, she has plenty of BFFs—in New York and San Francisco and Boston and Washington, D.C. Still, in her adopted hometown, there's no one to call at the last minute for girl talk over brunch or a reality-TV marathon over a bottle of wine. 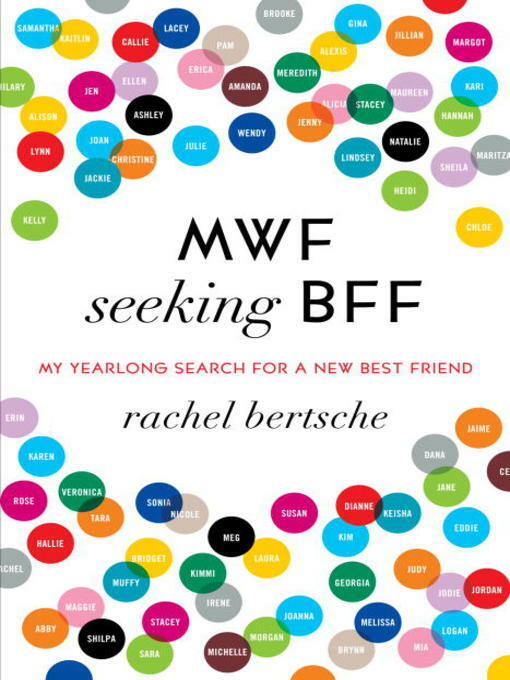 Taking matters into her own hands, Bertsche develops a plan: She'll go on fifty-two friend-dates, one per week for a year, in hopes of meeting her new Best Friend Forever. In her thought-provoking, uproarious memoir, Bertsche blends the story of her girl-dates (whom she meets everywhere from improv class to friend rental websites) with the latest social research to examine how difficult—and hilariously awkward—it is to make new friends as an adult. In a time when women will happily announce they need a man but are embarrassed to admit they need a BFF, Bertsche uncovers the reality that no matter how great your love life is, you've gotta have friends.